If you're looking to save a few bucks on your next pizza order, it's hard not to find decent pizza deals at most of the big chains. 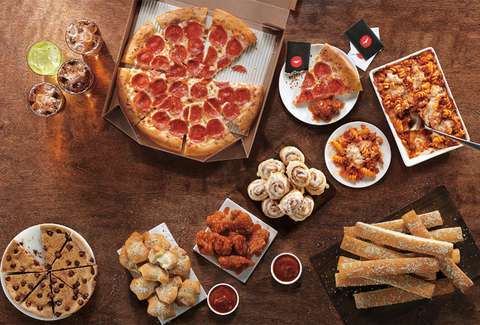 Pizza Hut, however, just rolled out a new way to potentially improve your slice-to-dollar ratio with an extensive value menu featuring a variety of shareable options -- pizzas, wings, pastas, and more -- for $5 each. Pizza Hut officially unleashed the new value menu, aptly dubbed the $5 Lineup, at its restaurants nationwide on Wednesday, according to a company spokesperson. The complete lineup includes everything from pizzas to desserts. Specifically, you can choose from a medium one-topping pizza, eight boneless wings, stuffed garlic knots, pasta, a double order of warm breadsticks, a giant Hershey's chocolate chip cookie, a four-pack of 20oz beverages, and even an order of Pizza Hut's all-new Cinnabon miniature cinnamon rolls. You just have to order at least two of the menu items and each will be five bucks. The value menu is available for delivery, carryout, and dine-in orders. Pizza Hut says the point of new deal is to make a wide variety of foods that are enough to feed multiple people available at lower price point. Then again, this just makes even easier for you to order a pepperoni pizza and giant chocolate chip cookie all for yourself.